How long will my test kit take to arrive? 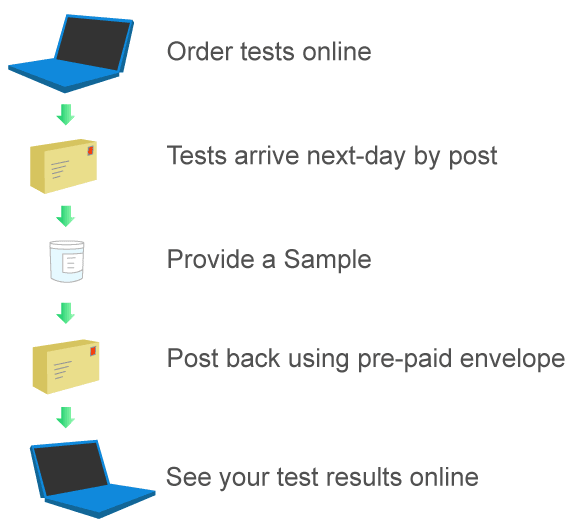 If you place your order before 5.00pm Monday to Friday then we will send the testing kit by First Class Post or Royal Mail Special Delivery, depending on your preference, that day. Normally this will mean that your testing kit arrives the next morning. The testing kit will be sent in a plain white bubble-wrap envelope that can fit through most letterboxes. There will be no mention of The STI Clinic on the outside. The label will only contain your name and address and it will be marked as Private & Confidential. For more details, please check the STI test packaging and contents page. What do I do when I get the kit? Simply provide a sample in the container provided and place it in the protective cover and business reply envelope provided along with a pre-filled form then send back by post. The processing time will depend on the test. Most results are back within 24 hours but some tests are back within 4 hours of the sample reaching the lab. Please see the individual test pages for a more specific answer. What happens if I test positive for anything? We will refer you to our partner clinic, which will be prepared to provide an appropriate medication for next day delivery. This service does not apply to any blood borne virus that is detected. We also have a policy of referring pregnant women to their obstetrician for a risk assessment prior to prescribing. How will the charge be listed on my card statement? For your discretion, it will be listed as 'Online Medical Service' and the description will be 'Private Medical Services'. How do I know that you are genuine? When we send the testing kit out to you, it will have the name of the laboratory on the request slip and the business reply envelope. You can then check that the lab is legitimate and reputable. What if my kit does not arrive? Simply call us and we will send a replacement free of charge. For deliveries within the United Kingdom, you can choose between First Class (£3.95) and Special Delivery (£6.95). For all other destinations, you can choose between International (£8.95) and Airsure (£11.95).